Categories: Global Network Dinning Cards, Dining Cards, Lifetime Membership Cards, Virginia Dining Card. Good FOREVER on all existing and future Kids Eat Free and Kids Dine Free offers anywhere in our ever-expanding global network. This Kids Eat Free Lifetime Card good for LIFE! 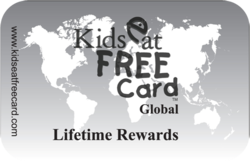 Never pay for another kid's meal again across the entire Kids Eat Free Card Global network of participating restaurants! Valid at any participating Kids Eat Free Card restaurant in any Kids Eat Free Card destination worldwide. As we open new cities and add new destinations with participating networks, you will automatically be able to get all the benefits. ALSO GREAT FOR LOCALS AND FREQUENT TRAVELERS! 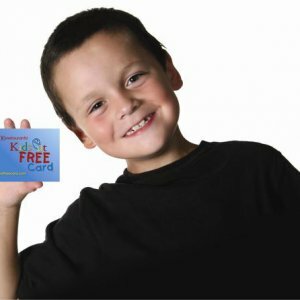 • Purchase the Kids Eat Free Lifetime Card. • Browse through our website to discover the restaurants and locations that are perfect for you. • Then, Show Your Card, Dine More and Spend Less!